Viking Skull have written a new album and launched a Kickstarter campaign to help with its release. The UK-based metal outfit went on hiatus in 2012 but are keen on a comeback, if fans can help raise the £10,000 needed to issue what will be the follow-up to 2012’s Cursed By The Sword. On their Kickstarter page, the band say: “So if you want to hear a new Viking Skull album, here is your chance to prove it. The band is currently on hiatus, but they would rather not be. The only reason we agreed to do this Kickstarter project is because for the first time ever, the money will go directly to the band and not to some music industry suit behind a desk. “Your donations and pre-orders will help pay for rehearsal space during the writing and pre-production process, studio time, engineer and record producer wages, and printing up the CDs and coloured vinyl. 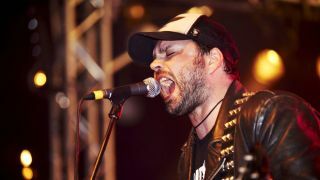 Viking Skull were formed in 2002 by members of Raging Speedhorn, initially as a spoof act to support Raging Speedhorn. The latest lineup is made up of frontman Roddy Stone, guitarists Dom Wallace and Frank Reagan, bassist Waldie and drummer Jess Margera. The Kickstarter appeal runs until March 14.